I didn’t actually realize it, but March 2013 may just be the month that my brain is finally melted by video games. BioShock Infinite, SimCity, Starcraft II: Heart of the Swarm, God of War: Ascension, Tomb Raider, and Gears of War: Judgement; and that by no means is the complete list. Two sequels, two prequels and two reboots; about all they have in common is that you could slap the words ‘hotly-anticipated’ in front of each and every one of them. Any two of those in a month would make it a good one for gaming (and you could argue that Starcraft and BioShock don’t even need any company). All of them? Gods of gaming, my cup runneth over; however, my wallet does not. 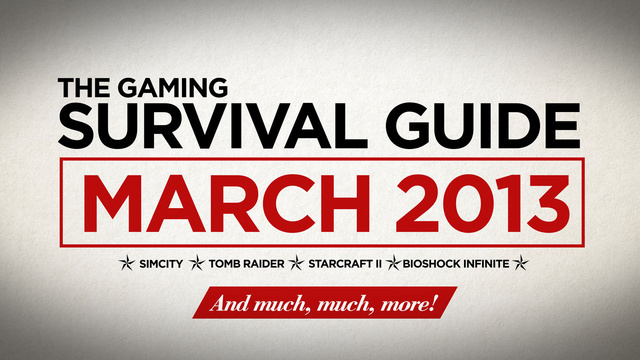 To ensure that you’ll be heading into this gauntlet with your eyes wide open, Kotaku’s Jason Schreier has composed a handy March Survival Guide – check it out! !#@!ing hell, I’m still playing Crysis 3!